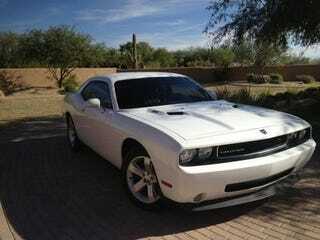 Wanna Buy Bristol Palin's Dodge Challenger? Apparently, Bristol Palin's car is for sale. And on Craigslist of all places. This post in Phoenix describes what must be Sarah Palin's daughter's white 2010 Dodge Challenger R/T for sale, also with a picture of Bristol's son. As far as the car, it has 14,000 miles and the five-speed auto and looks pretty stock and in good condition. Credit the statement it's kept in an air conditioned garage to stop the Arizona heat from melting the car. But why is it on Alaskan plates, then? If you have any doubts that this is in fact Bristol's muscle car of choice, look no further than the Internet's leading investigative journalist, Perez Hilton. He says it's legit. So Bristol wants $27,500 for her two-year-old Challenger. KBB says a basic 2010 Challenger R/T with this mileage should go for about $24,000 in good condition and $25,000 in excellent condition. Unless star power from someone who had a low-rated Lifetime reality series or was a Dancing with the Stars contestant means something to you, maybe you can haggle Bristol down a little.